These Raskullz helmets are a head-turner. Sure, I tend to pay closer attention to bicycles then most. After all, I did drop out of college for 3 years just so I could work at a bike shop and race bikes. Repeatedly, parents would come in to get their kids fitted to helmets, and, repeatedly, the kids would scrunch up their faces and whine about the helmet. Raskullz helmets attack the #1 problem with childhood head injuries: kids not wearing their helmets. Until now, bicycle helmets have not been a fashion accessory -- if anything, they are the antithesis of fashion. The bane of every child. The dreaded curse of bicycle riding. Traditional helmets are hot, sticky, chafe on the chin, and made fun of by the danger-loving kids living next door. But think about it -- kids will wear cool hats all day long! 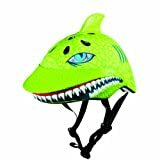 Raskullz has capitalized on this and introduced a whole line of helmets that are so cool that you might have a hard time getting your kids to take them off at bedtime. The Raskullz Helmet actually creates a true 3D helmet with fins, noses, eyes and ears. There is currently eleven total designs inspired by everyones favorite animal friends -- both real and imaginary. Suddenly, the helmet becomes a head-turning accessory that every child is proud to wear -- even if it is still a little uncomfortable. Do You Wear A Bike Helmet? I have actually been hit by a car while riding a bicycle. Accidents do happen. Be careful! Check out the line-up of critter Characters! it goes without saying, but these helmets meet both the ASTM international and the USA Consumer Product Safety Commissions standards. The helmets use ExoTuff, a brand new material manufactured by Coryal that is more UV resistant that traditional plastics -- meaning that the helmet is likely to last longer than other helmets. I have to admit, the Years 5+ is not something I would want to wear on my head for a long ride, as it is a little small for me, but if your ride is typically just to the park and back, this might be the perfect helmet for the whole family! That shark helmet really looks good!